Here you'll get Pakistan Air Force Commission Jobs 2018-19 PAF 123 CSC Online Registration | joinpaf.gov.pk announced for the Pakistani Nationals who belongs to Medical Field and looking to join Pakistan Air Force. 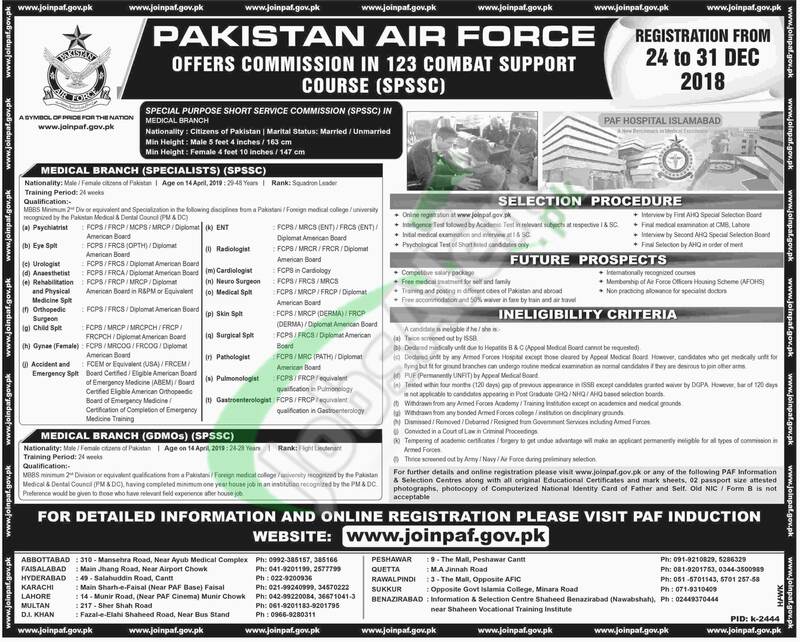 PAF 123 CSC Course announced in multiple categories such as (Medical Branch (Specialists) and Medical Branch (GDMOs) and all interested individuals can apply for the relevant discipline. Candidate possessing MBBS 2nd Division from a Pakistani/Foreign Medical College/University recognized by PM&DC is required to apply and the last date for online registration is 31st December 2018.